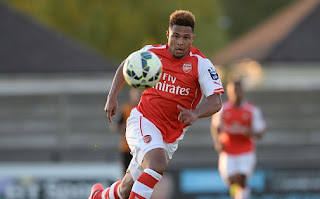 Arsenal youngster Serge Gnabry plans to leave Arsenal teenager Serge Gnabry has hinted a move away from Emirates Stadium this summer after his struggling season, according to Inside Futbol. Arsenal teenager Serge Gnabry has hinted a move away from Emirates Stadium this summer after his struggling season, according to Inside Futbol. The 19-year-old struggled last season with injuries and failed to make any first team appearance. However, he featured eight times and scored three in them for the under 21 side of Arsenal. Gnabry has two years left on his current contract and he has no plans to stay as he did not give future guarantee to Arsenal in an interview. When asked about his future at Arsenal the youngster replied that currently he is under contract with Arsenal and is focusing on the European Championship. The last time the youngster played a first team game was against Bayern Munich in Champions League in March 2014. Gnabry has only featured 13 times for first time since moving to the Gunners from Bundesliga side VfB Stuttgart in 2011. The German starlet who has won two caps for Germany under 21 side is yet to be called for the senior level. Gnabry could struggle more next season as Arsenal are already looking for World Class strikers and with their signature he is certainly going to decrease his chances further. But Arsenal manager Arsene Wenger will surely want to keep him as he is still a highly rated forward.